Roseville scoops the pool at Christmas shoot! The NSDRA conducted the annual Christmas shoot on Saturday 7 December 2013. In target rifle, the top 5 places were as follows; Stephen Tofler, Mark Buchanan, Dmitri Kazakov, Fernando Gregorio and Tim Walter. There could be a question as to whether Stephen Tofler is eligible to win anything in a Christmas shoot! Well done Stephen on a welcome return to form. Angus Martin also was a winner. In F Class Standard, Allan Humbert had a return to form to finish in top place. Well done Allan! Many turkeys and hams found their way into the hampers of Roseville members. Robert Kozminski was delighted to win his first ever trophy in F class. Fernando Scoops The Pool at Lithgow! On Sunday 1 December 2013, Fernando, Mark and Tim (AKA The Three Muscatears) attended the Lithgow Prize Meeting on a clear, mild, sunny, Sunday. The course of fire was 500y, 500y and 600y. Mark started off in winning form with a 50.3 at the first 500y, followed by 50.8 at the next 500y. 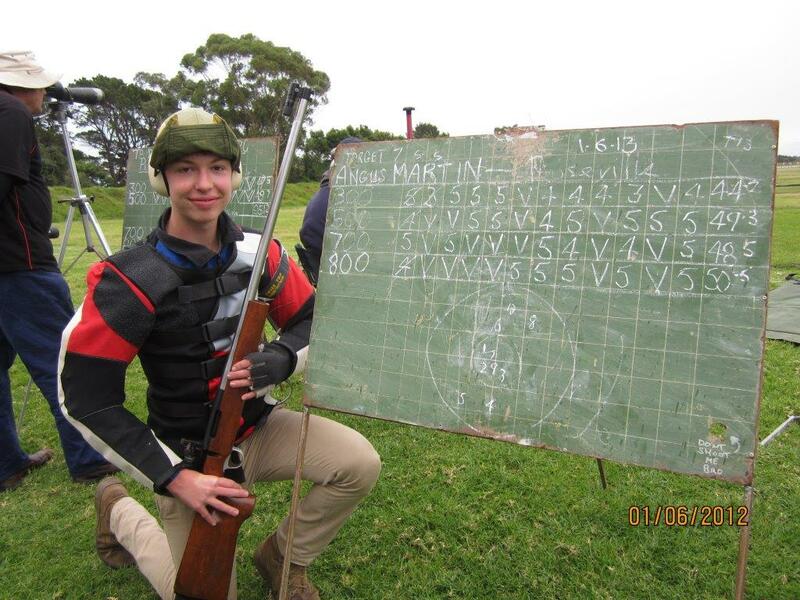 Tim started with a 48.4 at both the 500y ranges and continued with the same score at 600y! Unfortunately, Mark struck tricky conditions at the final 600y and finished with an uncharacteristic 46.3. Fernando had a high first sighter, but was in the centre for the next 3 shots and finished with 49.6. Fernando won 500, 500 and 600 yards in B Grade and of course, blitzed the B Grade Aggregate with a total of 148,12, which would have placed him 8th in A Grade. 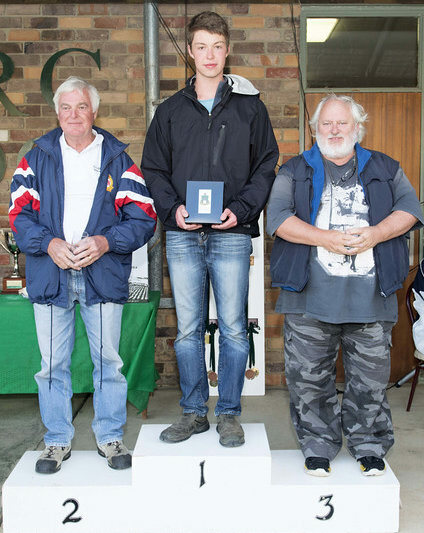 The top three places in A Grade all fell to Lyndhurst shooters, namely, Ben Emms, Rob Sweegers and Les Frazer. TGJB (The Great Jim Bailey) came 4th! So, as they say Fernando, “Congratulations and welcome to A grade”. I am sure you will soon be making your mark there, even using that bloody bloop tube! 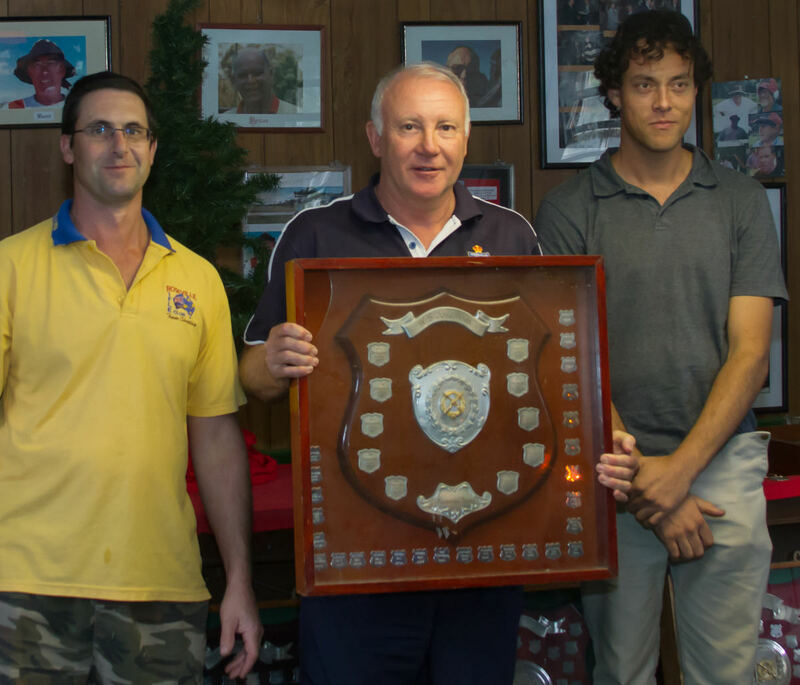 At the conclusion of shooting on Saturday 23rd November 2013, the NSDRA conducted a presentation of trophies for the 2012 – 2013 year. Roseville dominated the results in several ways. The first trophy presented was the trophy for the Josephson Teams Match which was won by NSDRA Purple Team from a strong MDRA Team. NSDRA have not beaten the MDRA in this event, for some years. Tim Walter was Captain/shooter and Phill Hodder was also a shooter in the team. Roseville Number 1 won the Arn Hammond Teams Match convincingly with a score of 1714.177 from Hornsby Number 1 with 1690.138. Roseville FS topped their event with 1515.054 from Hornsby RSL Blue with 1506.053 with a strong finish at 800 metres. Roseville Number 2 came second in the handicap event with 1736.095 , which was won by Gosford with 1741.107.
current year. 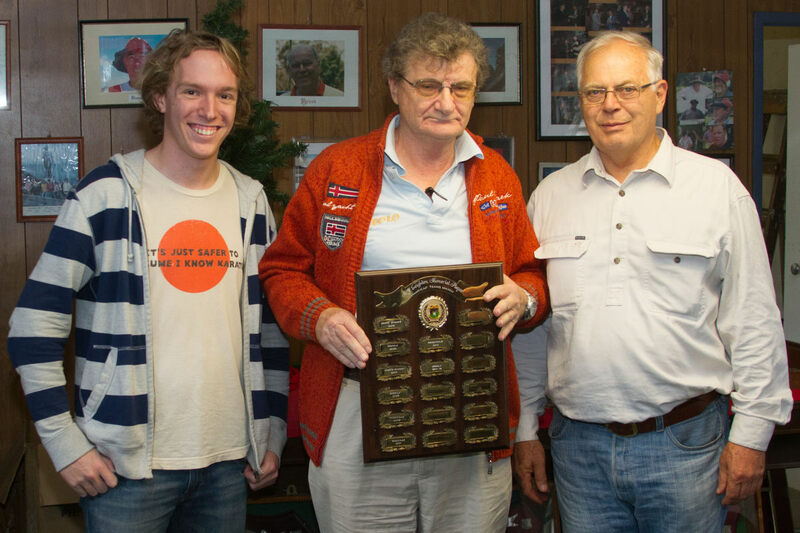 Obviously this is a major achievement well deserved by Dmitri for his continuing development of the Hexta-2 electronic target and his continuing assistance on a weekly basis to fellow club members and other club members as well. 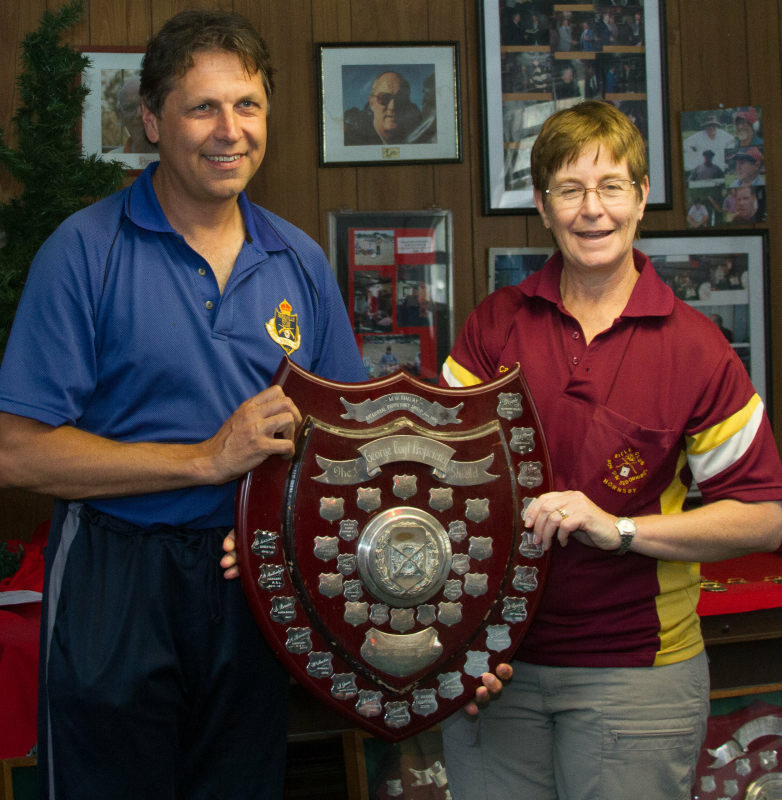 Canberra Rifle Club 100th Championships Shoot. 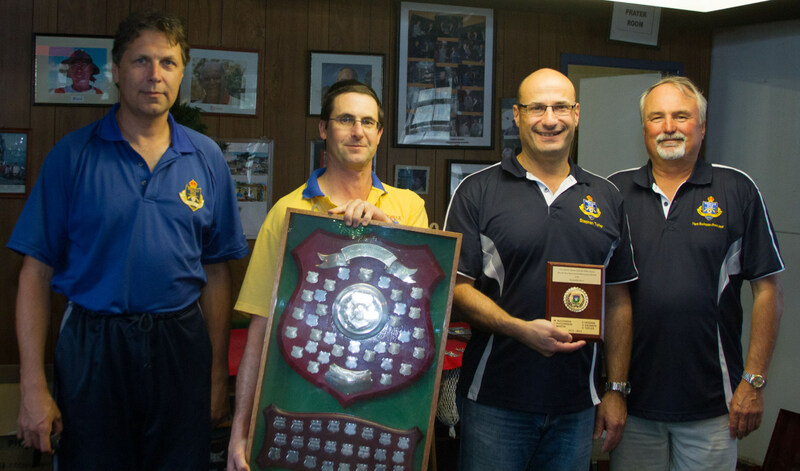 Mark Buchanan, Fernando Gregorio, Gary Faulkner, Angus Martin, Andrew Martin, and Allan Humbert attended the Canberra Rifle Club 100th Anniversary Championships between 13 and 17 November 2013. Former member Keirin McCamley also attended. 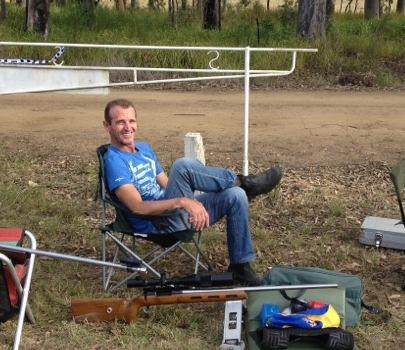 Only Mark Buchanan shot the whole of the Grand Championship, coming third in the 600 metre match during Stage 1 of the R A Rolph Aggregate and finishing 20th. Mark came first in the first 800 metre match in Stage 2 of the Queens and finished with 391.36 to win Number 12 Queens badge. Mark finished 6th in the Grand Aggregate. 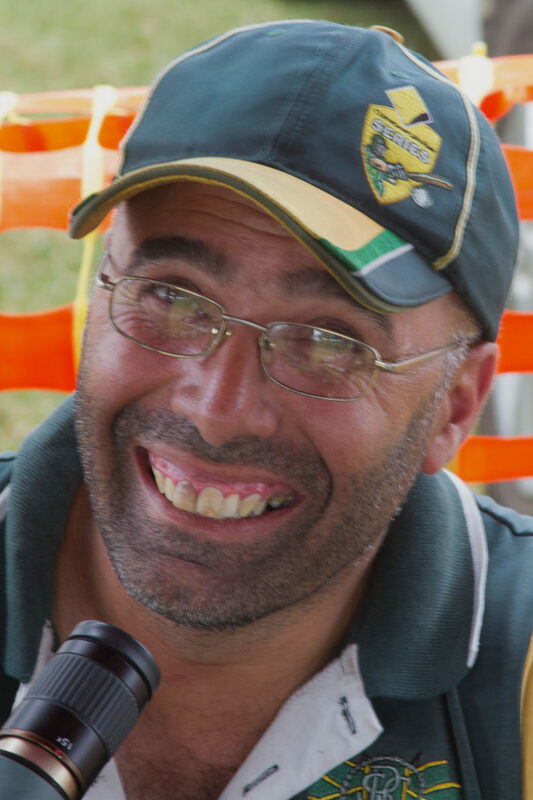 Fernando Gregorio finished Stage 1 of the B Grade Queens in 4th place and did the same in Stage 2, however, in the progressive aggregate3, he was coming in second place, only 1 centre bull behind the leader, Shaun Wingrove, on 287.25. 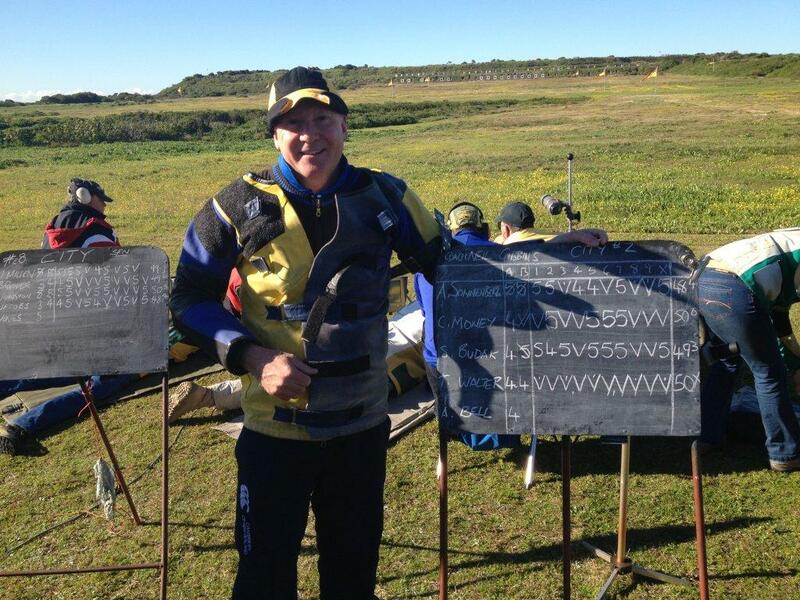 Stage 3 saw Fernando shoot a 48.3 to Wingrove’s 49.3 at 500 metres, however, at 600 metres Wingrove shot 46.3, while Fernando struck a horror patch to record 42.0. 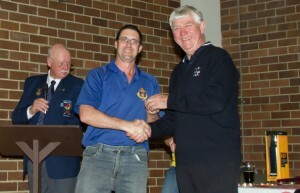 Fernando finished 4th in the B Grade Queens with 377.27 with Sean Wingrove winning with 382.31. 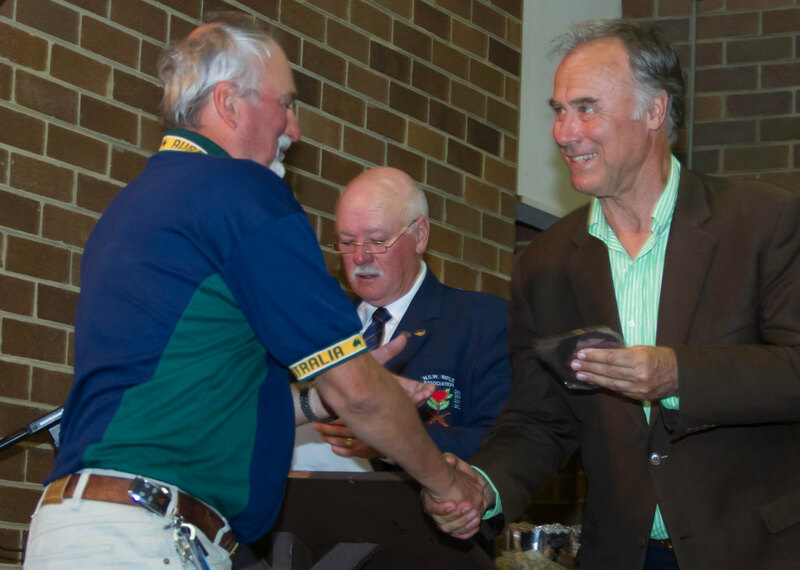 Angus Martin shot a 44.01 at the final 600 metre range, to finish second in the C Grade Queens with 372.16, only one point behind the winner, a very experienced looking Richard McRae, on 373.24. Along the way. Angus won the silver medal at 300 metres, the gold medal at 600 metres, and the bronze medal in Stage 1. Angus won the gold medal at the first 800 metres range in Stage 2 with a fine 50.03, a feat which eluded most A Graders. At the second 800 metre range, Angus won another silver medal with a fine 47.04. This was enough to see Angus win the gold medal for Stage 2 with 142.12, a clear 2 points above second position. Angus won the silver medal in at 500 metres in Stage 3 with a 48.00 and with his 44.01 at 600 metres this saw him finish Stage 3 in third place for a bronze medal. Tim Walter came seventh at the second 800 metre match with 49.04. Tim finished in 53rd place in the Queens with 381.24 after shooting a 45.03 at the last range. Andrew Martin finished with a strong 48.03 at 600 metres finishing in 83rd place in the Queens with 365.19. Gary Faulkner shot consistently well, coming 7th in the Queens Stage 1, 4th on Day 3, which included a silver medal at 600 metres, and finishing 7th in the F Standard A Queens with a score of 451.27. Allan Humbert, shot 417.13 to finish in 33rd place in F Standard A Grade. Keirin McCamley shot 387.28 to finish 28th in the Queens and to win a Badge. Congratulations to those who attended this shoot and escaped a wet Sydney weekend. Roseville members were a bit unlucky not to come home with the B Grade and C Grade Queens, but Fernando and Angus must be proud of their achievements as must Mark, Gary and Keirin. Shooting commence at 09:00 hrs. This Championship is open to all TR A, B and C Grade competitors, “F” Class Open and “F” Class Standard A and B competition, Military Bolt competition. 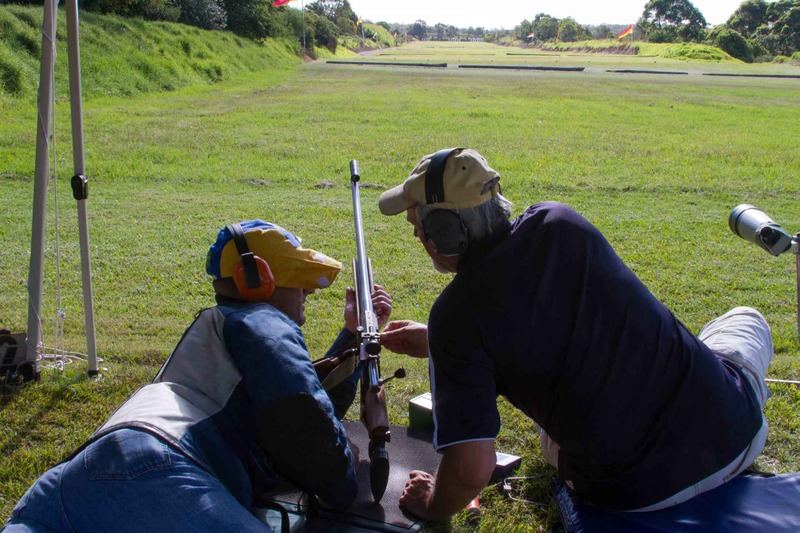 There were quite a few Roseville members that competed in this year’s NSW Queens at Anzac Rifle Range, in both the McIntosh “Lead-Up Shoot” (Allan, Gary, Mark and Phill) and the Queens (Alex, Allan, Jon, Gary, Mark and Phill) Mike was there to lend support for most of the time. Conditions seemed to be fairly consistent at the start but by the second day of the Lead-Up they became harder to pick. Gary came 2nd in the first 300m with a 59.3 and 1st in the second 300m with 60.4, and on the second day Gary got 3rd at 700m with a 58.2. Phill claimed silver on the 2nd 800m with a 50.6 and Gary 1st with a 55.3. The results from the 2 day Lead-up were Phill 17th, just one point away from a badge, Mark 24th, Gary 6th and Allan 8th. The star in the first day of the Queens was Alex with an excellent score of 49.5 in C Grade to claim top spot at 500m. Mark shot a great 50.8 to gain 2ndplace for the second 500m, Alex shot a 71.3 4th (15 shot match) to be just a few centres away from coming second! Gary shot a possible 90.5 to win Gold at that distance! Alex finished 2nd in that days Ag, and Gary just missed out coming third by 3 super centres! The second day of the Queens saw Allan get a Silver medal at 300m with a great 60.6. Allan was again in the 60’s for the second 300m but could only get 4th place with his 60.2. With a 57.3 Allan got Gold in the first 600m! Mark finished 5th in day 2 of the Queen’s, and Allan was 1st by 4 points in F STD A Grade, well done Allan! It’s hard at the top, in the last day at 700m Mark shot a very respectable 50.8, but that only gained him 7th place. Alex was back after having a day off, and convincingly won that range with a 50.3 in C Grade! Gary was just 1 super centre away from 3rd in the last 800m 15 shot match with a 86.3. Mark finished 6th in the last days ag clean on 125.17, one of 5 shooters on the same score and 2 centres away from first place! Gary was 5th with 145.6 just 1 point away from 3rd place. Now the finishing scores for the Queens and Grand Ag. Mark finished 5th 494.61 for the Queens and 9th for the Grand, Gary 5th for the Queens with 569.31 and 2nd for the Grand! Allan 9th for the Grand. The conditions were much more trying, in my mind, than most of the previous NSW Queens. Again you had to be lucky with your squad and time of shooting, conditions were at times unreadable and many top class shooters and coaches were getting caught with inners, birds and even outers. When the luck is on your side you just have to do your best and hope for the best. In the end it’s all about enjoying your sport! Gary Faulkner, Fernando Gregorio, Robert Kozminski and Tim Walter attended the West Wallsend Prize Meeting last Sunday. The weather was beautiful and conditions were generally easy but a watchful eye had to be kept on the mirage which reversed direction on occasions. 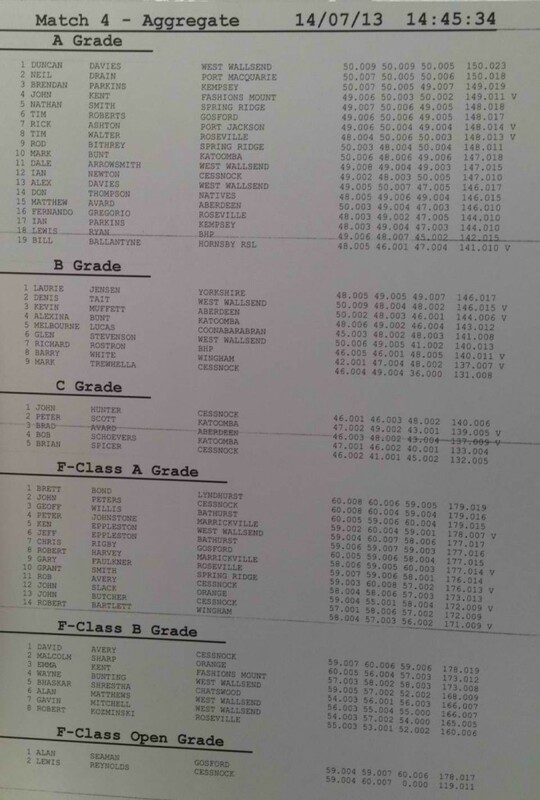 There was a very strong F Class A Grade contingent and scoring was high. We shot 500y, 500y and 600y. Gary Faulkner shot 59.07, 59.06, and 58.01 for a total of 176.14 to finish 9th, but only three points behind the winner Brett Bond with 179.19. Robert Kozminski was attending his first prize meeting with Roseville since becoming a member the day before! Robert shot a credible 55.03, 53.01, and 52.02 to finish with 160.06 in F Class B Grade. Fernando Gregorio shot 48.03, 49.02 and 47.05 to finish with 144.10 in 16th position in A Grade, however, he was not happy with the way his rifle performed. Tim Walter shot 48.04, 50.06 and 50.03 to give him 148.13 and 8th position in A Grade. Tim picked up a bronze medal for his 50.06. Don Thompson of Natives Rifle Club arrived and departed in style, piloting a helicopter! Duncan Davies, not surprisingly, took out the day with 50.09, 50.09, and 50.05, stating that the last range was difficult! Well done Duncan on a fine 150.23. 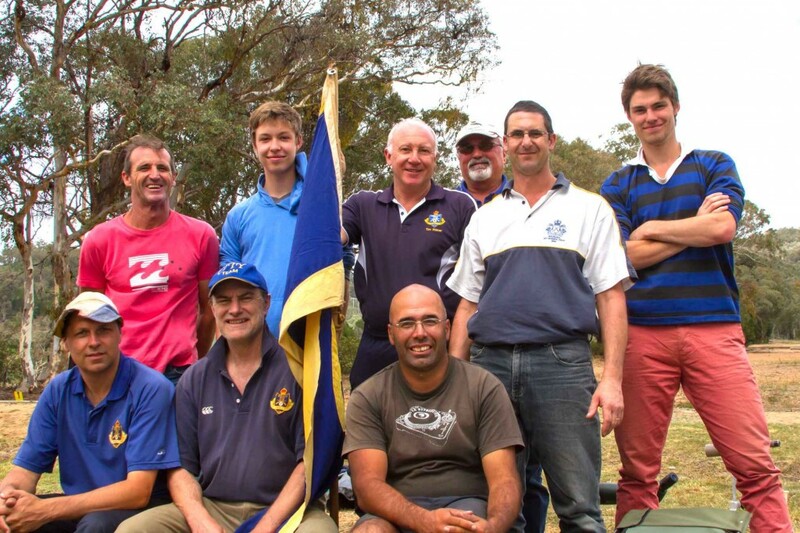 On the weekend of the 6th & 7th of July some members from Roseville Rifle Club shot various team matches at Malabar Rifle Range. On Saturday afternoon there was the District Teams Match, which is shot in teams of 5 shooters under a wind coach at 7&800m. 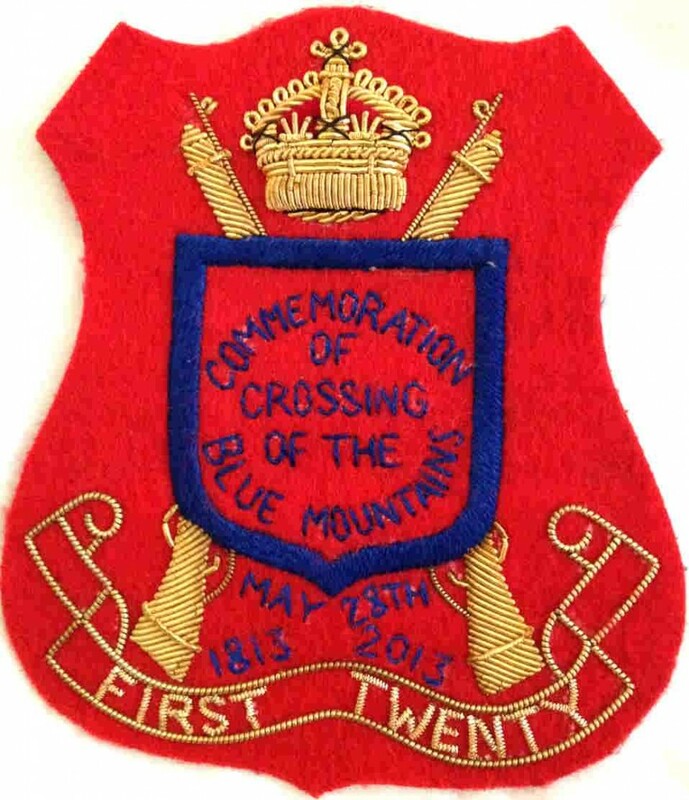 This year our District fielded two Target Rifle Teams and one F Class Std Team. The shooters from Roseville were, Tim Walter (Team 1) & Phill Hodder (Team 2) with Mike Hodder coaching the #2 Team. The #2 Team shot well in the first distance to be leading by one point! Tim shot extremely well at 800m and posted a 75.10 to top score out of all the teams! On Sunday I had the pleasure of being a team member for the City team in the City vs Country match (although as a reserve). This is a very prestigious Team Shoot, shot in 3 teams of 5 shooters under 3 coaches at 5,6,7 & 800m. Tim, Phill, Angus and Lachlan represented Roseville. There were many notable performances during the four ranges from both teams, but most notable of all was our Captains magnificent score of 50.10 @ 500m, his first! This was made so much more significant because he had to stop shooting after the 8th shot, as a round wouldn’t chamber, he then had to deal with a stuck projectile in the barrel and powder through the action and bolt. Once his team members sorted out this issue he continued with great composure to finish where he started off with two V Bulls!! Well done Tim on a wonderful performance under pressure. 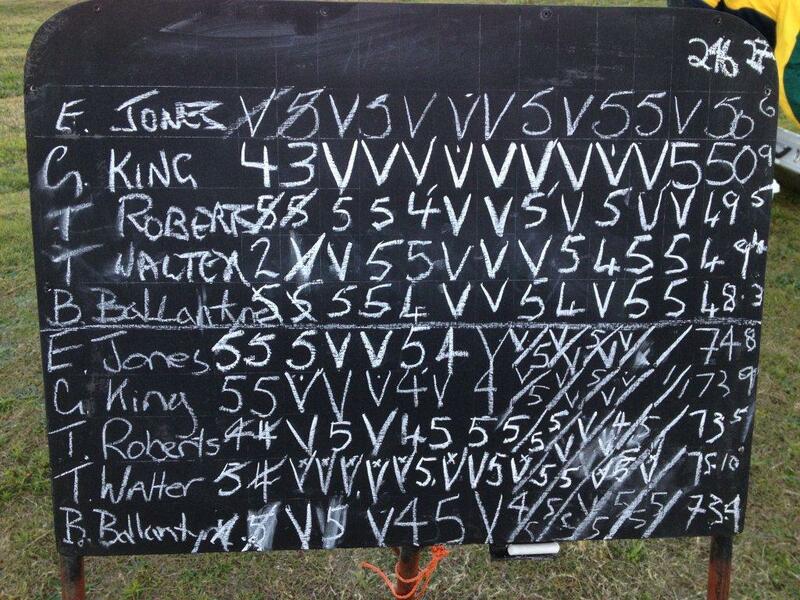 Unfortunately even with this impeccable result the City Team lost by 24 points! Angus and Lachlan Martin represented the U25 City team and they were both having a close battle between themselves. Angus shot a personal best of 50.7 @700m and by the end of the third range the two brothers were only four centres apart. The big brother finished stronger @ 800m with a 50.2 to gain a 3 point win over Augus. Well done to both the Martin’s. Phill Hodder was the Senior Club Champion in Target Rifle and represented the Club in this major event shot on Hornsby Range on 1 June 2013. The event was shot over 300m 500m 700m and 800m. Phill’s scores were: 47.1, 50.5, 50.4 and 49.2 for a total of 196.12. Phill did not start as well as he would have liked at 300m scoring a 47.1, but he settled down at the next range with a 50.5, followed by a 50.4 at 700m. Phill was unlucky not to get his third possible 50 for the day at 800m, when his last shot went wide at 3 o’clock. Tim Roberts from Gosford won the day only dropping one point! 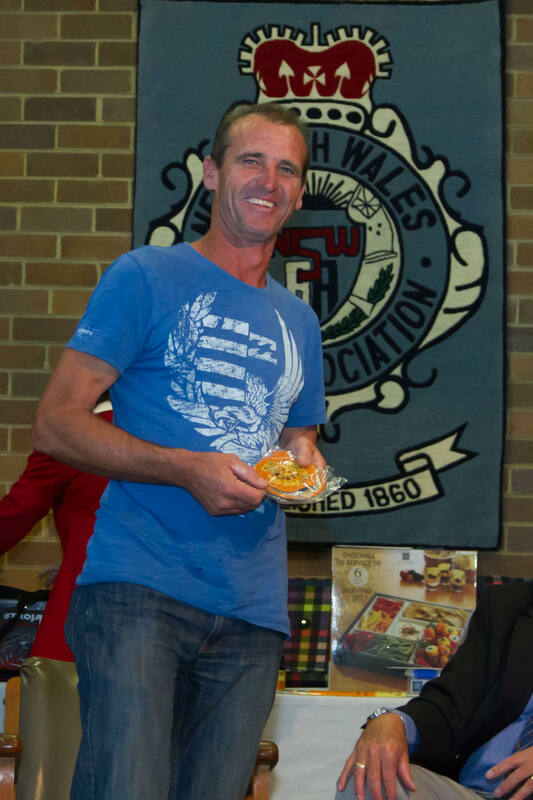 Geoff King from Hornsby was second with two points down. 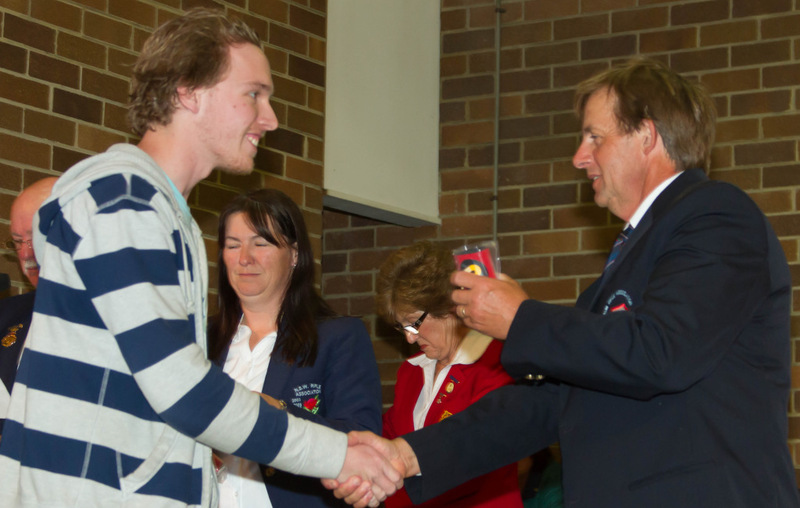 Angus Martin was the Junior Club Champion in Target Rifle. 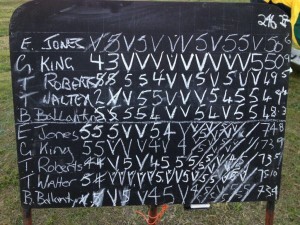 His scores, as indicated in the attached photograph, were; 44.2, 49.3, 48.5 and 50.5. This was Angus first 49 and first 50! What a good time to get them to win the event. I have not seen a C Grade shooter string so many V bulls together before now. Angus’s position has improved markedly in recent weeks and this has obviously aided his improvement as much as his new shooting jacket. Keep up the good shooting Angus. I hope you are available for Arn Hammond next year! 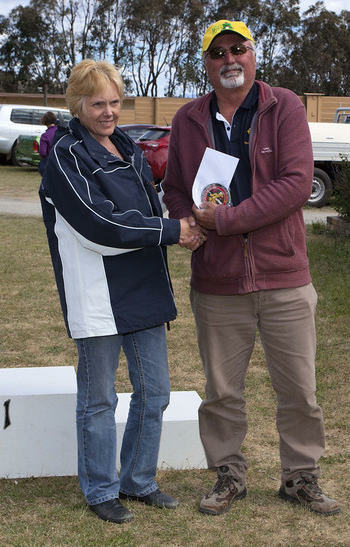 Jenny Saleeba was the Club’s F Class Open Champion, but unfortunately, she could not attend the shoot-off due to a prior commitment in Canberra. Maybe next year Jenny? Allan Humbert was the Club’s F Class Standard representative and Allan shot 227.8 to come third. One bad range spoiled Allan’s chances and he has now gone touring on his motor bike! Well done everybody and thank you to all those club and family members who attended to help with scoring, marking and to give our reps support on the day. 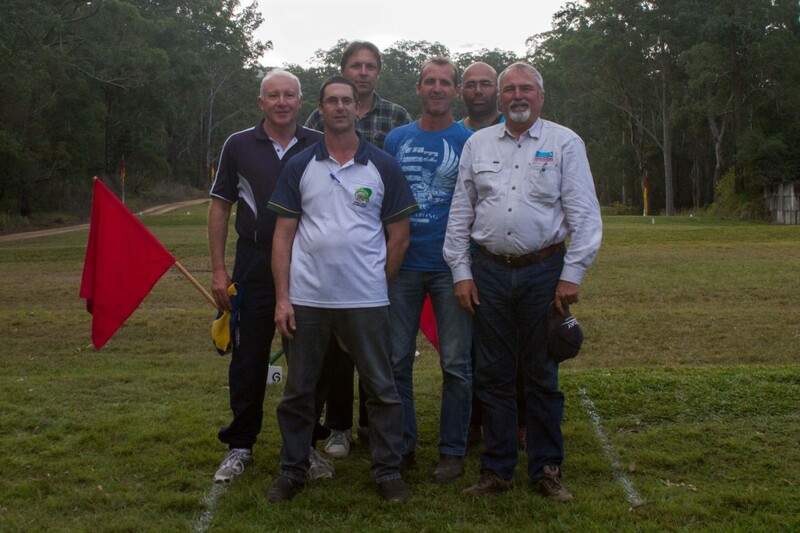 Six Roseville shooters attended the Wingham Championships over the June long weekend this year. The crew were (left to rigth) Tim Walter, Phill Hodder, Dmitri Kazakov, Gary Faulkner, Fernando Gregorio and Mark Buchanan. 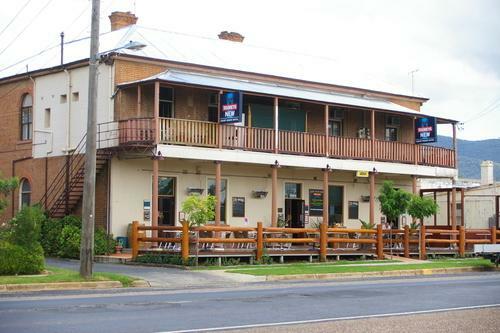 The rest of us arrived on Friday afternoon and all, except Gary, stayed at the Australia Hotel in Wingham. On Friday afternoon the competitors shot the Sweepstakes 15 shots at 600 yards on Wingham Rifle Clubs new electronic HEXTA-002 targets. Dmitri shot 74.8 (plot is available here), Tim shot 73.7. 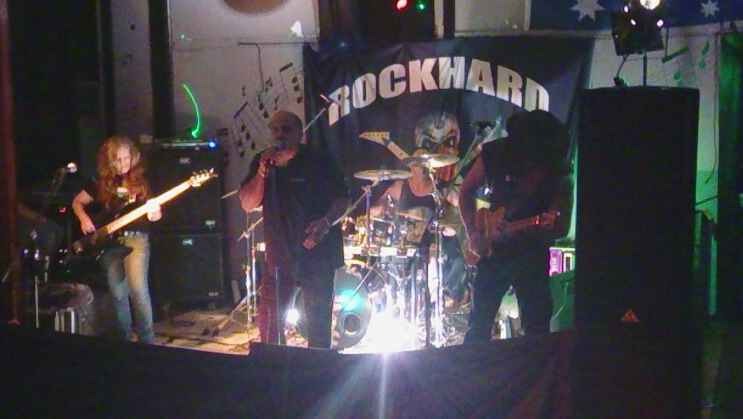 Friday night saw the crew, except Gary, who was wisely absent, enjoying food, wine and an absolutely brilliant hard rock’ n roll band at the Wingham Hotel. Next morning, after breakfast at a local café, the shoot started in earnest. Day 1 was shot over 500, 400 and 300 yards. Day 2 was shot over 500, 600 and 600 yards. Dmitri kicked off with a 50.8 at 500 yards to come third. Fernando was close behind with a 50.6 and Mark with a 50.5. Phill and Tim were close behind with 49.6 and 49.1. Mark and Dmitri continued with 50.5 and 50.4 at 400 yards, but at 300 yards, Mark shot 49.3 to finish with 149.14 and Dmitri with 47.6 to finish with 147.18. Gary shot 60.4, 60.5, 59.4 scoring his first two 60’s in a row and coming first in the Day 1 Aggregate in F Class B Grade, this would of given him 2nd place in A Grade F Class..
Well done Gary! Two prize meetings in a row! Day 2 saw Mark continue his good form with a 50.6 at 500 yards and a 50.9 at the first 600 yards to win the range. Dmitri also opened with a 50.6 and followed with a 50.4 at 600 yards. Phil scored a 50.5 at 500 yards followed by a 49.4. Tim fired 49.4 and 48.2. Gary shot a solid 58.3 and a 58.5. The final 600 yards saw mixed results. Dmitri finished with a 48.4. Phill shot the same score. Tim managed a 49.5 and Fernando, after finding his rear screw was loose, fired a 50.6! Mark was in the groove with his new barrel, but unfortunately, put a central bull on the target next door to score 45.7 at the last range! Gary fired a 60.3 to win Day 2 and the F Class B Grade Grand Aggregate. Gary’s score would have been good enough to also win the F Class A Grade Aggregate, and it goes without saying that he was thrilled with the result. Roseville’s star this meeting was Gary Faulkner with 179.13 and 176.11 a Grand Aggregate of 355.24. A great weekend was had by all and I urge anyone who has not yet come away for a prize meeting to have a go next time. Mark Buchanan and Tim Walter attended the Victorian Rifle Association Championships at Wellsford Rifle Range, Bendigo, between 17 April and 21 April 2013. Unfortunately for Mark, there were only 20 Syme Badges! Mark came second at 300 yards and third at 500 yards in the First Stage of the Queens. 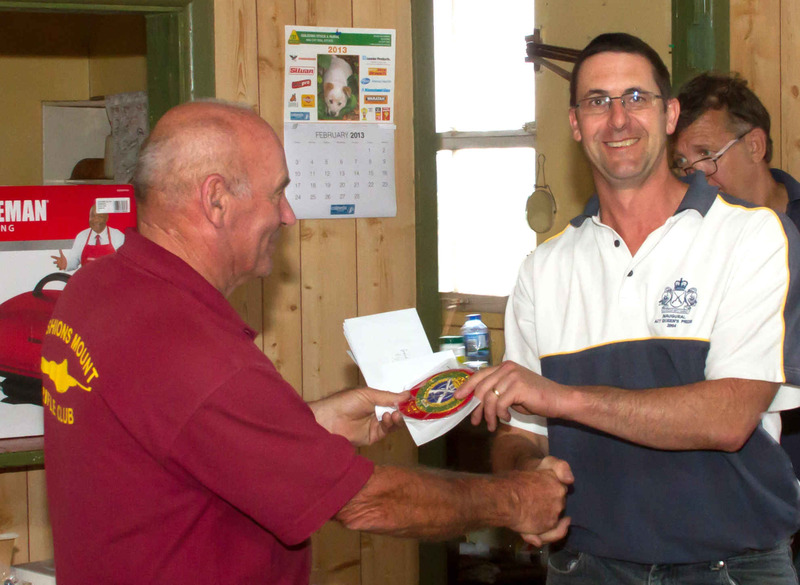 Tim won Top Veteran Shooter in the Queens which pleased him as much as winning his first Queens Badge since 2004! Keirin McCamley, our Associate member, shot 284.17 to finish 41st in the Syme and 378.31 to finish 55th in the Queens giving him 662.48 and 39th place in the Grand Aggregate. Overall, a good result for Mark and an excellent shoot for Tim to finish in the top 20 Badges and top the Veterans as well!. At the Katoomba Bi-Centenary Crossing of the Blue Mountains shoot on Sunday 29 April 2013, Mark Buchanan shot 48.3 at 500m and 75.8 at 500m to win the second 500m match and finish 5th in the Aggregate with 123.11. Tim Walter continued his form after topping Hornsby Range at 800m on Saturday with 99.12, by shooting 49.3, 74.7 at Katoomba to finish 6th in the Aggregate with 123.10. 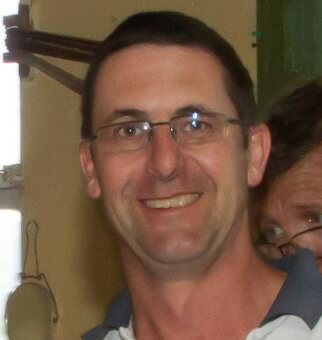 Fernando Gregorio shot 44.4 and 70.4 at Katoomba, sadly putting a centre on the wrong target at the first range! Mark, Tim and Fernando all won First 20 Badges. Gary Faulkner shot in F Class. The Arn Hammond team shoots have finished for the season 2012-2013 with both Roseville TR #1 and F Class Teams victorious again. Team #1 had a large buffer going into the last range, 800m, and in the end needed every point to secure victory over Hornsby #1. Conditions seemed mild before the shoot but all coaches found the wind very tricky and hard to keep in check. Roseville #1 scored the third lowest score that day in the trying conditions but congratulations goes to Roseville #2, who won the last range by 2 points from Gosford. Roseville F Class were coming in second place before the final stage from HRSL Yellow. They showed tremendous strength and ability to not only take the day from Hornsby by 3 points but also take over the lead with a final points lead of 9 from HRSL Blue! Congratulations to all the team for another great win. The F Class team consisted of Allan, Mike, Don, Graham, Gary, Rochelle and Matt. Nine Roseville club members: Mark Buchanan, Dmitri Kazakov, Andrew Martin, Angus Martin, Lachlan Martin, Fernando Gregorio, Gary Faulkner, Phill Hodder and Tim Walter attended the Mudgee District Association Prize Meeting held at Mudgee Rifle Range over the Easter weekend of 30/31 March 2013. Anne Martin and Rochelle Martin also attended to add a feminine touch to the weekend and to act as bearers of fruit and coffee on Day 2! Fernando booked rooms at the Courthouse Hotel for all except the Martin clan, who stayed at a resort some distance out of Mudgee. Practice was conducted at 600 yards on the Friday afternoon where Mark, Phill, Fernando and Tim checked their zeros and wind reading ability. Day 1 saw three shoots at 500 yards. Andrew put his first counting shot on the wrong target and Lachlan found his zero was out, unfortunately putting both shooters behind the 8 ball from the start. Mark Buchanan came second at the second 500 yards with 50.8 finishing third on the day with 149.17. Phill Hodder was close in fourth place with 149.12 coming third at the first 500 yards with 50.5 and Dmitri finished with a solid 147.15. Fernando shot 50.5 at the second 500 yards to finish the day with 145.12 and Tim scored 144.7. Lachlan on 142.10 edged out Andrew with 141.9 while Angus finished with 135.4, coming second at the second 500 yards with 46.2. Gary in F Class shot 168.4. Saturday night saw us all dining at a Vietnamese restaurant in a private courtyard. Back at the pub and hungry after the Vietnamese restaurant, Dmitri enjoyed his first game of darts winning a drink from Tim! Day 2 was three shoots at 600 yards. Mark and Phill both opened with 50.4 followed by 48.6 and 48.7 respectively. Dmitri opened with a 49.6 at each range, being unlucky not to win both ranges. Tim opened with 49.5 and 49.4 and Andrew with 48.4 and 47.4. Lachlan opened with a fine 50.4 followed by a 47.3, as conditions were getting tricky. Fernando opened with 49.4 followed by a 50.6 to win his first range in A Grade. Well done Fernando! Angus shot 37.1, 47.2 and 44.1 coming second with his 47.2 and firing a central on the wrong target for his 37.1! Gary shot 164.8 and finished second in the first 600 yards with 58.3. By the last 600 yards the mirage had disappeared and the wind was changing quickly and difficult to read from the flags. Phill proved consistent to finish with 49.3 for 296.26 to win 5th Badge. Well done Phill! Mark finished with 48.4 to finish with 295.31 to win 6th Badge. Well done Mark! Andrew, Dmitri and Tim were cut up with 44.2, 45.1 and 44.4 respectively. Lachlan and Fernando were more respectable with 47.1 and 47. 5 respectively. Mark Thurtell of Orange Rifle Club won the meeting with 299.37/300. Congratulations Mark! It was great to see such a good roll up from Roseville and good to see Phill and Angus perform so well. Let’s do the same thing next Easter with a few more members present?